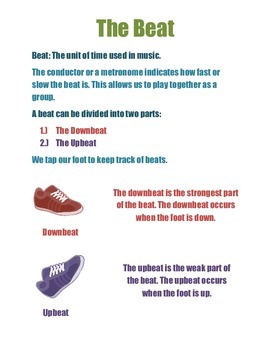 This is a reference sheet that I have used to help my young musicians understand the concept of the beat. It is especially useful for helping students to understand why we tap our foot when playing. This could be included in a young musician's class binder or could also be used as a small poster for the classroom. This is a free sneak peek of my Basic Music Rhythm Packet. It includes handouts such as this one to help your students understand basic rhythms as well as worksheets to test their knowledge. If you find this resource useful, please give it four stars! Also, if you enjoyed using this resource, please check out my other instructional materials and worksheets!